Today Bing has a picture of Easter eggs. Google has a picture of Cesar Chavez. Mixed feelings about this. I didn’t expect an Easter theme from Google. I have very low expectations about them. They ignore a lot of important holidays and events for more obscure or geeky ones. Easter is the single most important day of the year for Christians though. Christmas pales by comparison so even though I am not surprised I am still disappointed in Google. The Bing one is at least Easter related in the secular sense. I guess they are trying to avoid offending non Christian people while still making a notice of the day for Christians. Not sure what I would have chosen but Easter eggs is probably not it. I’m reading an old book. Well actually its an old story and I’m reading it on my Kindle but you know what I mean. The book is Allan Quartermain by H. Rider (Henry Rider) Haggard and it was written in the late 1880s. Let me tell you things were different back then. I don’t mean just the obvious technology that wasn’t there back then either. One expects that in a book that takes place in an earlier time. The striking differences are cultural. Books written today that take place in a previous era tend to view those times though the lens of today’s mores and standards. This is not the case with a book that was written during that time. There the reader sees the mores and standards of that time. That is what is the big difference. I’ve read a number of books from a hundred or more years ago. I’ve got a nice collection of the original Tom Swift books for example. I see some different attitudes towards technology in those books. But the thing that always gets to me is the attitude of the rich, entitled white male primary characters towards women and minorities. These books are written by and for those white males and that is obvious from the language and the actions of the characters. Women are portrayed as second class. Not as strong emotionally, physically or mentally as men. Blacks are not portrayed as well as women. Words that are no longer accepted in polite society were regularly used without apology as casually as we would use a term like “African-American.” It’s all quite striking to me as a reader. I can imagine that books like these had an influence on the young men who read them a century ago. I suspect that the people who bought the books and who wrote them thought about the spirit of adventure, the notions of self-reliance, and in the case of the Tom Swift books an acceptance of science and technology and viewed those as good things. In many ways they probably were (and are). But the social aspects were something that were probably not obvious to the authors or readers. That was just the way real life was. I wonder if there were books for African Americans in those days? I suspect not that many. In the 1980s for example few African Americans could read and fewer still had the time or money for leisure reading. There were probably books for young (white) women but I haven’t run into any yet. I’m open to suggestions to some I should read though. I wonder what sort of lessons those books taught – intentionally or otherwise. For now I am enjoying a look into the past but happy that we have progressed since then in so many ways. 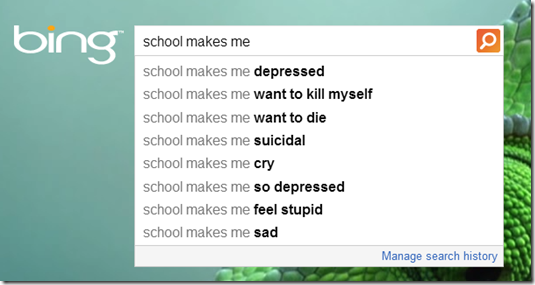 I saw a blog post by SCOTT MCLEOD at http://dangerouslyirrelevant.org/2013/03/school-makes-me.html where he showed the results of typing “school makes me” into Google to see what suggestions it made to complete the query. I decided to try the same thing with Bing. The list that came up there may be even scarier than what Scott’s list showed. 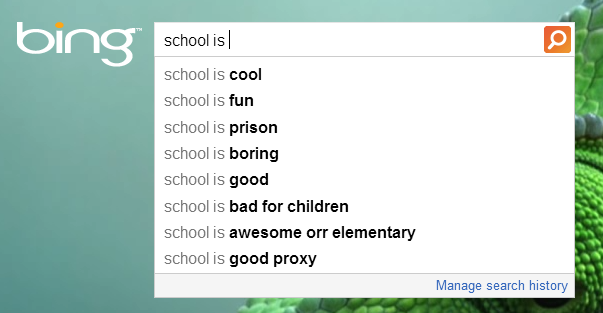 I’m not completely sure what they options are based on but there isn’t a single positive statement in the list above. What does it say about our schools and how can we fix it? I decided to try some other options. 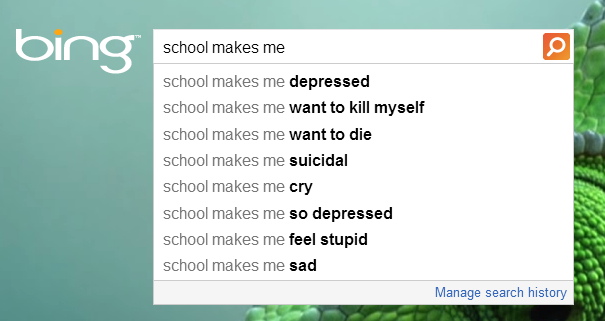 For example “school is” and I got a mix here.